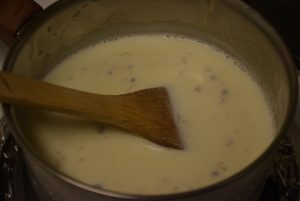 Rasmalai. This recipe is loaded with sweetness of chhena Mithai. It requires the minimum ingredients just three- milk,sugar and panner (Indian cottage cheese). 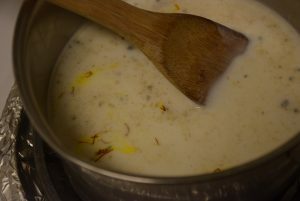 The basic idea of making this kheer was shared by my dear friend Shikha Tiwari with me. 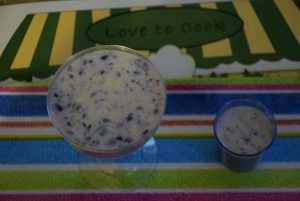 I added blueberry to give it a nice blue hue and little sour taste. Last year I participated in a challenge to cook nine fasting foods of nine different colors for the nine days. I although fast for the last two days of shashti(6th) and saptami(7th) day of the Navratri. According to that color theme, I prepared blue, yellow, green, gray, brown , white colored dishes for our Goddess Durga. So adding blue-berry is completely optional. 1. 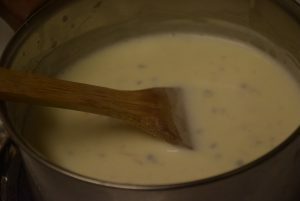 Add milk in a non-stick heavy bottomed pan and bring it to a boil on medium heat. 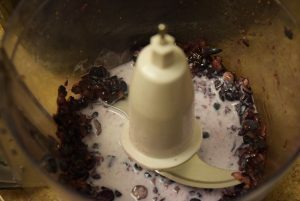 Also add the saffron strands, kesari milk mixture and nuts after 10 mins.In the meanwhile blend the blueberries in a chopper or food-processor. 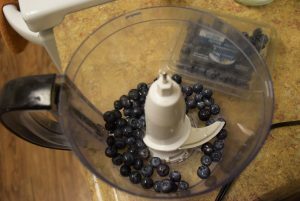 To help in mincing, add some milk to the crushed blueberries to form a fine paste. 2. 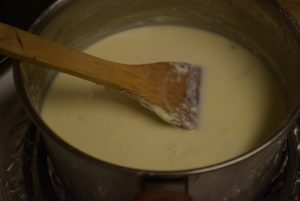 Stir it continuously to avoid sticking at the bottom. 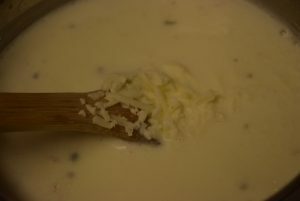 When the milk reduces to half the quantity ,add the grated paneer. This will take approximately 45 mins on no.2 of the electric stove (less than medium heat). 3. Stir it and let it cook for another 15 mins. The mixture would start smelling of Chhena now. 4. 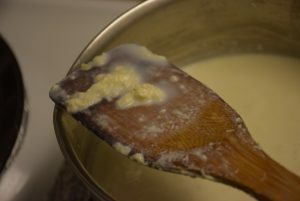 When you see the milk has further reduced, add the sugar in it and let it dissolve completely. 5. Turn off the heat and let it cool to the room temperature. 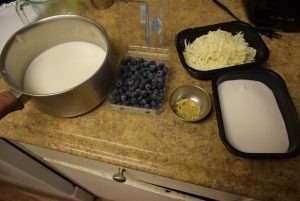 Now add the blueberry paste to it. 6. Refrigerate it and serve cold. You may add any of the fruits like strawberry, rose water, bananas, mangoes,etc. as per your likes . 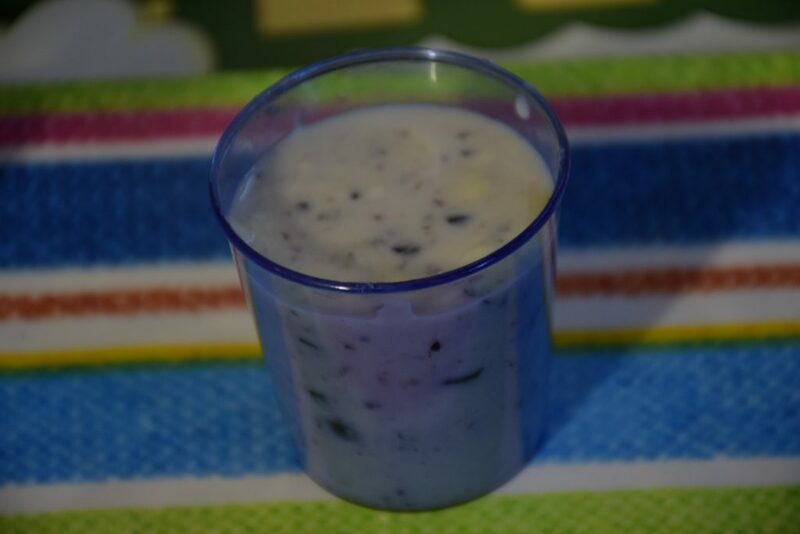 This pudding (kheer) also tastes good without any fruit added. On non-fasting days , you may add any fruit essence with fruit to brighten up the pudding altogether. 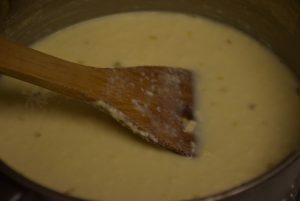 For more recipe of pudding please see pina-colada kheer, sewai kheer, dry sweet sewai, shamak chawal kheer too. 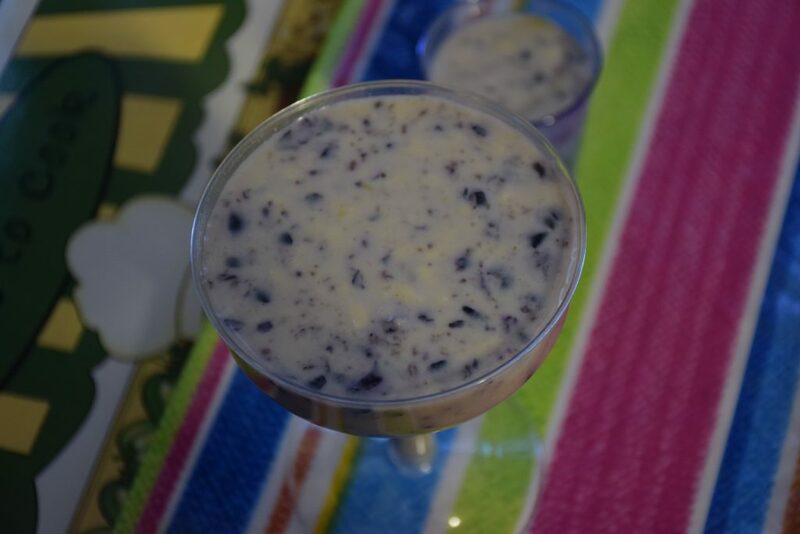 This entry was posted in Desserts, Food, Recipes, Vrat Recipes and tagged 3 ingredients, blueberry, Carenshare, chhena kheer, coarse pista powder, easy, Elaichi, fruit, malai, Meethi Sewai, milk, paneer, pina colada kheer, pudding, quick kheer, saffron, sama chawal kheer, shwetajindal, strawberry, zindagisikhati.